Like most NASA press buildups preparing for a great announcement, there is a let down with the latest report of a new discovery– flowing water on Mars. It has long been suspected but always said to be largely seasonal and from the poles melting. It isn’t exactly water as we know it– lots of carbon on the planet– but it is always nice to prove what had long been suspected. What else awaits confirmation? Lost civilizations? The Face as a manmade — excuse me, I mean intelligence made– artifact? I don’t think so, but there’s been some hot debate over some form of seasonal growth on Mars. It’s been dismissed as “defrosting marks,” but amidst all the defrosting is there some interesting spore or mold-like growth? 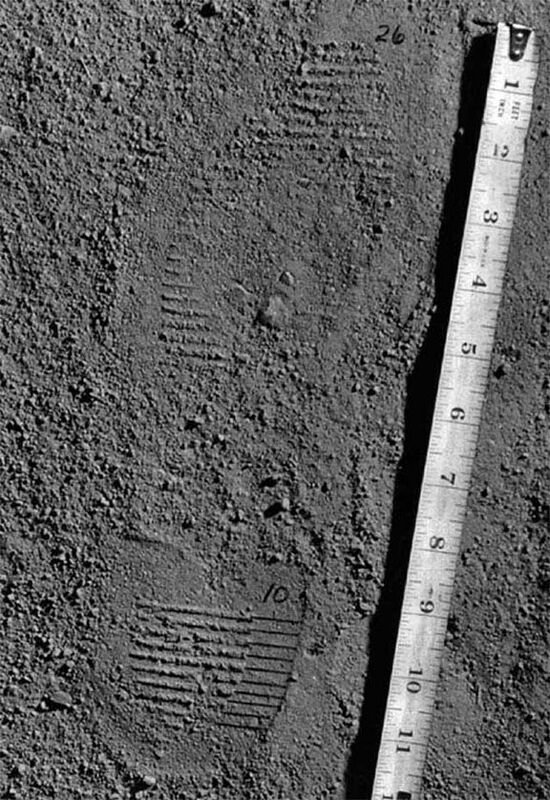 There are some provocative pictures, and even Sir Arthur C. Clarke insisted NASA take a look at these more closely. 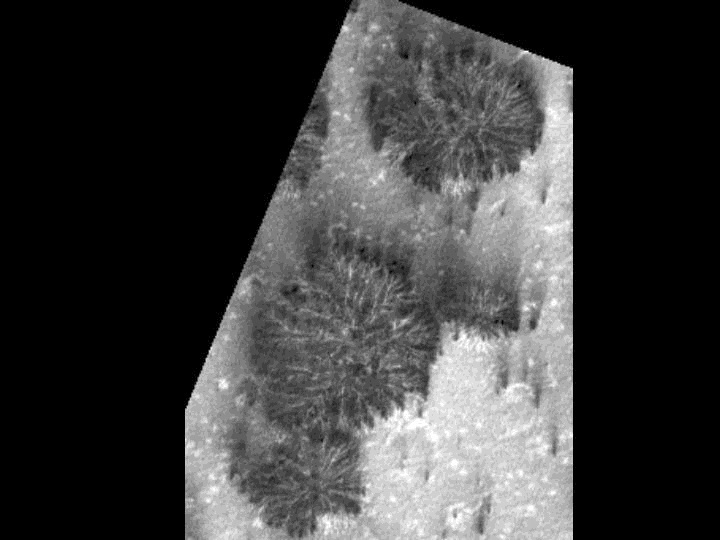 Martian trees? Sir Arthur wanted to know. I have the feeling that the pursuit of EAR/ONS will be successful in the foreseeable future, though we are in for a gulf of time in which enough must be done to inspire a DNA test. When the case of THE NIGHT PREDATOR is solved, however, I think it will be quickly archived. No lingering desire will remain to probe into his motives. They will have been written off as a desire for thrills by a demented though calculating fiend. Little mystery of interest will remain. DNA taken from a dead body will satisfy everybody. But identifying is not always the same as solving. For EAR/ONS identifying will no doubt be enough. But for The Zodiac Killer I wonder. Both represent two extremes. EAR/ONS devoted all his calculating mind to the execution of his crimes; ZODIAC devoted his evil “genius” to the marketing of his otherwise mundane shootings, leaving open the possibility there was much more to his crime spree than merely thrill killing. 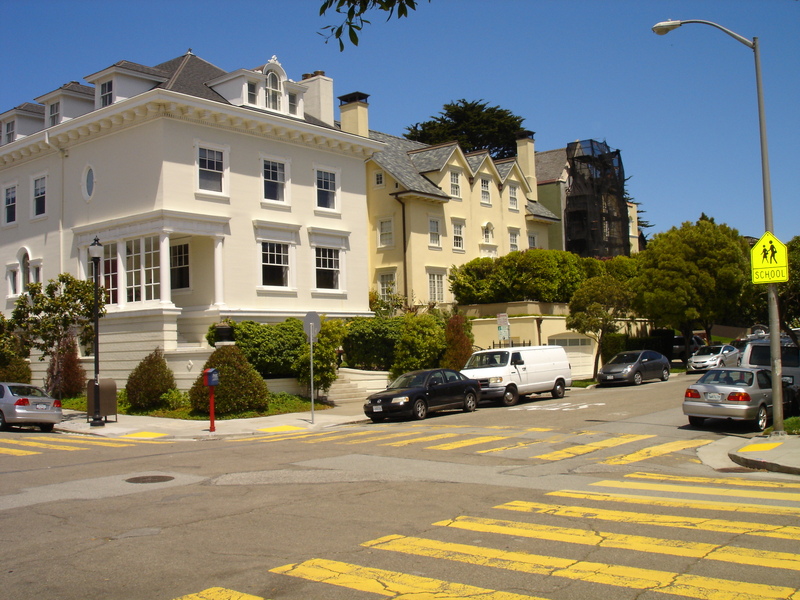 Washington & Cherry– The San Francisco crime scene. Zodiac’s terror campaign would have had little impact on San Francisco had he not struck in the City proper. Was that his motive? Had he already planned to stop and needed a City attack to give weight to the years of writing threats that followed? When one genuinely attempts to solve the varied crime sprees that make up cold cases one has to confront and accept the difference between identifying and solving. One also has to accept that within the system identifying is enough. District Attorneys don’t need to prove motive to get a conviction. There is nothing narrow with that precept, but it does create a rather razor blade attitude. This is not a hobby for them. It is their job. When a dead man is identified as having been the perp of a cold case, the case is solved. But for the rest of us, for the populace in general, we want motive. Why did such a villain do what they did? Without a living suspect motive is hard to prove. “Thrill”– the standard excuse– isn’t enough for some cases. For some there has to be more. The ZODIAC is such a case. From an evidentiary approach, ZODIAC committed almost a perfect crime spree, though not a very original one. As an essentially drive-by killer, he had little contact with his victims. Except for ballistics there would be no way to trace him, only the gun. Pitch the gun, no evidence. (The letters would seem a mistake, but they may actually be a different kind of clue which I will bring up later.) And, frankly, I think he had just dumb luck. ZODIAC struck at a tumultuous time in America in which a terror campaign carried a punch. He is given an exotic flare because of his hood at Lake Berryessa. He catered to our curiosity because of his cryptograms. All this remains his image today. Popular culture has been blinded by ZODIAC’s fame and confuses this with having been an exceptional villain. But his actual crimes were of little complexity. More than one jurisdiction said he merely seemed a spontaneous thrill killer who got lucky with his marketing. Perhaps it is not that simple. But after 47 years the marketing isn’t evidence. In fact, we’re left with almost nothing. Even the DNA isn’t certain. Leigh Allen was cleared because his DNA didn’t match that on the stamps of the ZODIAC’s nasty missives, but many choose not to believe it. The DNA would have to match someone who looked like the ZODIAC composites. Such a match would do. Lack of a match means nothing. When you try and tackle the case seriously, especially 47 years later, you learn how daunting it is. It is the lack of genuine evidence by legal standards that has allowed The ZODIAC case to devolve into folklore– anybody can and has claimed a father or relative or friend as having been the ZODIAC and then written the appropriately shallow book or had their 15 minutes of undeserved fame. For EAR/ONS that is not possible. There is no doubt about his DNA. There can be no genre of “my daddy did it” books since a test would easily prove it. The pursuit of EAR/ONS has also been blessed by 3 honest books, two written by actual detectives on the case. I’m afraid no one can say that for the first books or even the latter books on ZODIAC. Did I say lack of legal evidence? Not only. Lack even of circumstantial evidence. What exactly is there? We don’t even know what type of car he drove. There is great, theatrical veneer, but after so much time there is only ballistics and handwriting. This one great hurdle must be cleared: Solving verses Identifying. For sometime now I have presented to the public my suspect for ZODIAC. Yet I have been choked at the seemingly insurmountable odds of proving it through the system’s standards. As I write HorrorScope, I begin to struggle with the reality that even if I finally do legally identify him, will I have solved the case? I have decried that ZODIAC was a cerebral killer. You can see all too well how his game of death developed. Maybe he knew how law enforcement worked, and this is why he struck in 4 different jurisdictions. That’s not too cerebral. Was his whole style the result of contemporary knowledge on how to reduce evidence at a crime scene? It doesn’t seem so. Why write those letters? Handwriting analysis could link him. 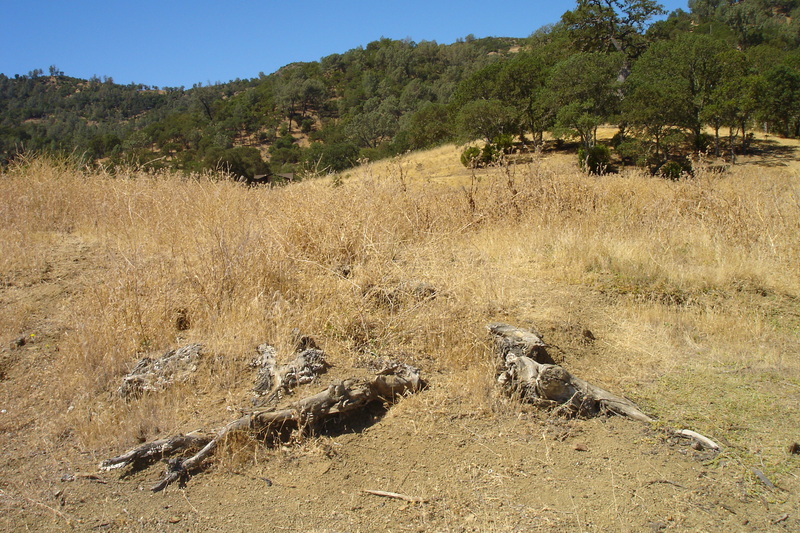 Why wear such a rare type of shoe at Lake Berryessa? Rather, it seems to be that ZODIAC’s inconsistency protected him. A wise choice or foolish mistake? Shoes that could be traced to the Air Force. 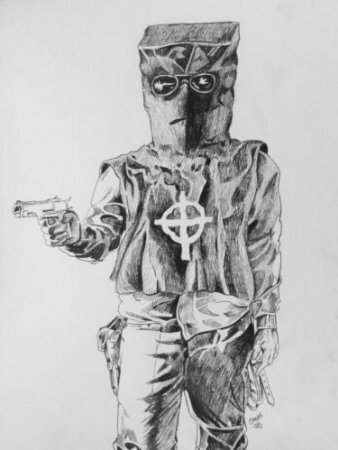 Not all the inconsistencies in ZODIAC’s crime spree can be explained, but if one thing can be surmised about why he didn’t take some precautions it is that his confidence was inspired by the fact he felt he was completely unsuspected and would remain unsuspected. ZODIAC struck from afar, so that he possibly believed he was far outside of any potential police dragnet. It is in this area where the folklore that Arthur Leigh Allen was The ZODIAC has proved crippling. The clues that ZODIAC struck from afar would have been more apparent had it not been for the grandstanding about local Vallejoan Leigh Allen. Allen would have been a natural suspect, as indeed he proved to be, and he would have taken the necessary precautions, such as to not wear Wing Walker shoes. 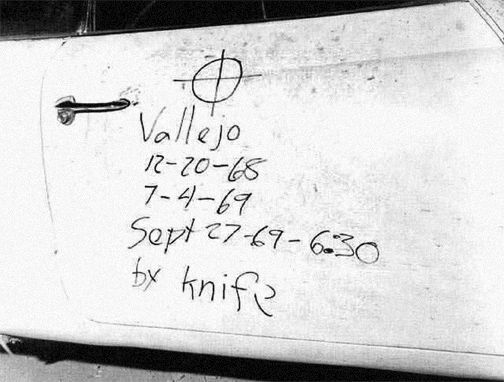 On the contrary, ZODIAC’s blatant evidence (handwriting; Wing Walker shoes) reflect someone who felt they had taken the necessary precautions not to be suspected. Worthless as evidence. True. But it is a clue, one that has continued to motivate me to pursue my suspect, a man who knew the area and yet struck from afar. Identifying The ZODIAC has been difficult for 47 years, and it still presents legal difficulties. Suspicion is enough for a hot case, but not for a cold one. It is perfect for a living suspect. Not for a dead one. How much more difficult will it be to “solve” after an already difficult identifying takes place? I usually don’t get into anniversaries, but on September 27, 2015, I watched Fincher’s Zodiac (2007) for the first time. I thought I best finally watch it. I came away with the same feeling everybody else has noted: there’s body but no soul. There’s the letter but not the spirit. It was a reenactment of some of the crimes and some of the attempts to investigate them, but nothing was put together. There was no antagonist or protagonist. It was a soulless chronicle. ZODIAC is not an ever-present and dangerous antagonist. He is not the object of the film; he is merely an excuse that sets the investigators in action. We see the actor playing Leigh Allen only 3 times, two of which are little better than a cameo. Sitting here Graysmith described the gorilla like shadow of Leigh Allen on the drapes. Fincher actually revealed a great truth. Without knowing ZODIAC’s motive, we are left with no soul. Fincher followed Robert Graysmith’s slant on things, but despite Graysmith sure he could identity ZODIAC as Leigh Allen, he still cannot give a motive. Fincher’s Zodiac likewise explained nothing. I am not a fan of Graysmith’s version of things, but even his book presented himself as stalking and being stalked by his suspect. There is no such interaction in Zodiac. 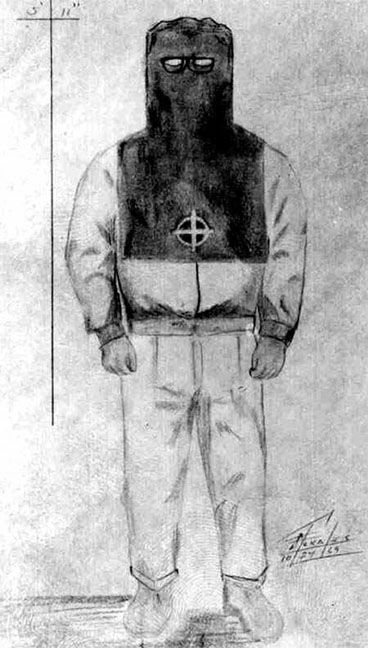 It would have helped it, but still it would not explain ZODIAC’s motives, especially the reason for the bizarre outfit at Lake Berryessa. It’s the attack at Lake Berryessa that confounds so many about Zodiac. The movie could have been done much better than being something made by fans for fans. 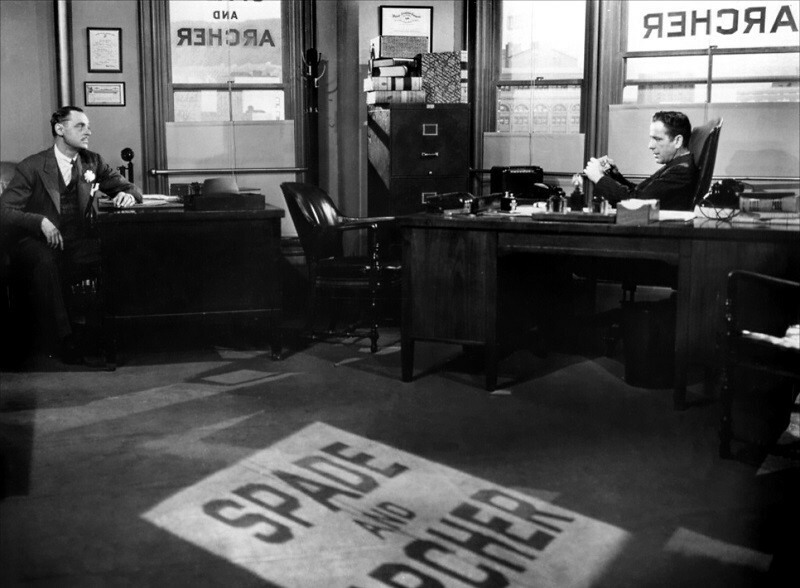 But Fincher was also hampered by the truth. Nobody knows what motivated a man to start such a crime spree, brag about it, get theatrical about it, then suddenly stop and continue a strange terror campaign through poison pen letters to the San Francisco Chronicle. But I wonder, rather fear, that ultimately this is the truth of the real ZODIAC. 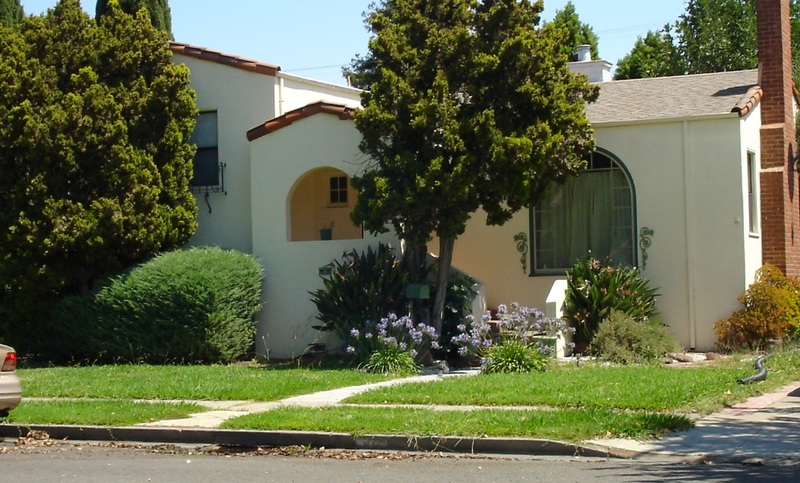 Even if solved now, will ZODIAC ever be more than a mere identification of the perpetrator? Can the spirit, motive, soul of the crime spree and all of its inconsistencies ever be delivered? As I write HorrorScope I pause. I cannot repeat the mistake of Body and no Soul. There must be one consistent motive behind so many inconsistencies. See what I have to put up with from cops/national heroes when they retire and get fat? Soon October and the witching time is upon us. I cannot think of anything more frightening than this. Was it for Ritual or Revenge? Father Alfred Kunz was a controversial figure. To his parish he was teacher and friend, but within the Church legal structure he was staunchly outspoken about corruption and sexual abuse. He was Swiss, and the Swiss are a hard nosed lot. Being born in the USA doesn’t change this. Kunz was also a man of conviction. He was a conservative Catholic priest with what has been said are some “unusual” interests. To be explicit: he believed that there was truth behind the occult and he was also an exorcist. Such attitudes and outlooks didn’t seem to go with a graying, kindly country rector, now 67 years old. His parish was small, about 146 families in Dane, Wisconsin. He didn’t take a salary. He lived in a small room attached to his church’s school. He drove an old car and was his own mechanic. He wouldn’t seem a very formidable figure. But he was. He had his own radio show. He was an expert in canon law, and he knew some very influential people. Father Kunz was thus both respected amongst conservatives but not entirely liked in the higher echelons of the Church. Along with Father Charles Fiore of nearby Lodi, he earned either enmity or mere dismissal from his superiors and mainstream Catholics by filing reports about sexual corruption in the Diocese. As an exorcist he also believed in Satan’s power working within corrupt members of the Church– the proverbial wolf in sheep’s clothing scenario. He was an associate and friend of Malachi Martin, one of the Catholic Church’s most controversial and hard to classify personalities. Martin believed in “Luciferians” in the Church and even wrote that Satan worshipers penetrated even the highest strata of the Church– the College of Cardinals. But something so exotic as this wasn’t on Kunz’s mind. He was going to expose sexual abuse against some priests. The date to do so was coming up: March 7, 1998. Both Fiore and Kunz were involved in the hour long Our Catholic Family on radio. It was a teaching tool where they expounded on the Eucharist and other traditional teachings. After taping on the night of March 3, 1998, in Monroe, the show was to undergo a format change under Fiore. Both were still small time, of course. Great promotions had not come their way. They were wee voices crying from the wilderness– but Kunz was persistent. And they had a following far outside their parishes. 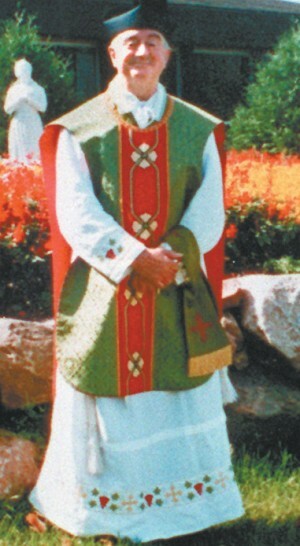 Kunz in his priestly robes. 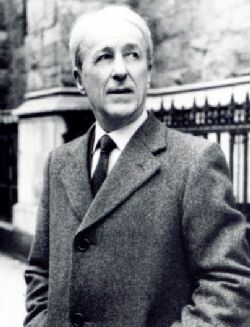 Being friends with Malachi Martin was controversial enough, but then also engaging in exorcisms. There’s another controversy. The establishment of the Church doesn’t like to see that mishandled. They don’t like rogue exorcists. They especially don’t like one in the boondocks. He may become a squire-priest amongst the bumpkins. The seeds of a cult. But Kunz wasn’t that. He wasn’t a separatist. He was teacher of the children at the church school, a respected figure and spiritual guide to all the Catholics about in the county. The Rev. 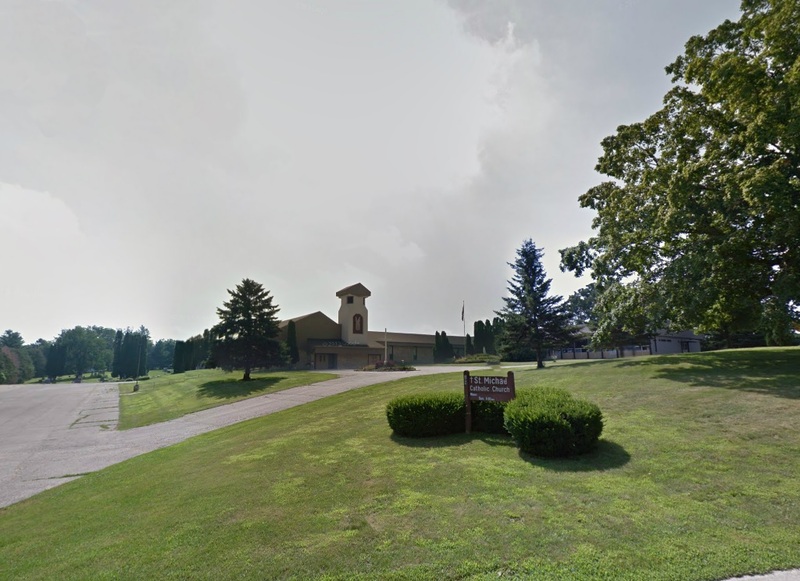 Father was in the midst of these controversies when on the night of March 3rd, 1998, Father Fiore dropped him off back at his parish after their joint radio show. It was about 10 p.m. Kunz plodded up the layer of early spring snow and went inside. Fiore drove away. Father Kunz received a call about 10:30 p.m.. It is not divulged as to whom it was from. The next morning at 7:00 a.m. he is found by one of the teachers, Brian Jackson. Kunz is in the hallway lying at the foot of a statue of Michael the Archangel. He had been in a terrible fight it seems. He is facedown in a pool of his own blood. His throat had been cut. Not a common way to kill someone. Takes some stomach and precision. It takes some forethought as well. It’s a messy way and must be done with the victim’s face away from the killer. Very little else is known about the details. Kunz most certainly had other bodily injuries. He had put up a fight with his killer. Having failed, bruised and insensible, was he then drug to the foot up the statue, there his throat cut. He was face down, after all. This may suggests he was unconscious and the villain clutched his hair, lifted his head, and delivered the blow. Was it with vengeful passion or ritualistic warning? It all depends if he was drug there. It seems symbolism. His Church was St. Michael The Archangel. But whose symbolism? A warning from within a dark element in the Church? A priest who didn’t want to be exposed? Or from someone within the school and parish? Needless to say, many weren’t impressed with the investigation. This included both some of those associated with Malachi Martin, and some law enforcement who are familiar with the jurisdiction’s methods. In true Agatha Christie style, the sheriffs suspected the man who found the body– Jackson. Supposedly, he hadn’t been getting along with Kunz over the running of the school. For such a disagreement it is remarkable a teacher would fly into a rage and butcher his priest and principle symbolically. 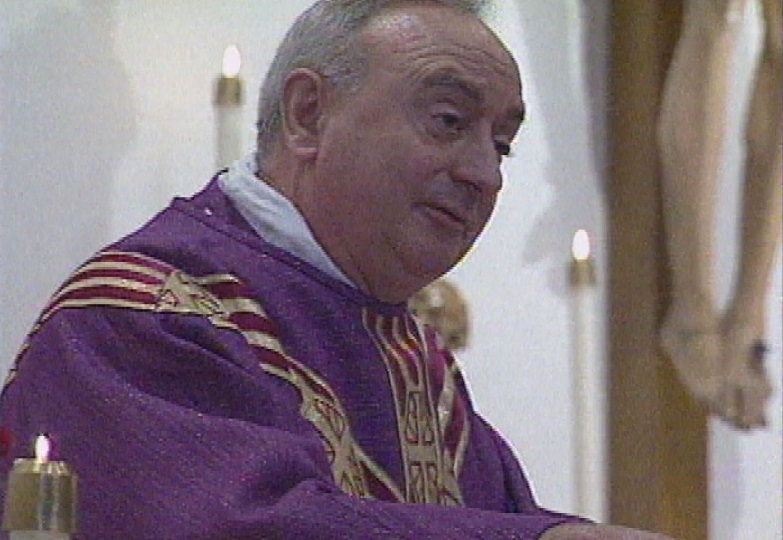 By accentuating this word in a news conference, it is obvious law enforcement was tempering the fear and theories circulating that Alfred Kunz was murdered ritualistically, either by a hit man within the Diocese, a priest on his own, or the devilish act of “Lucifer’s Lodge” within the Church– Satanists fearing exposure because of Kunz’s private investigations and those of his network of likeminded priests. There are other tidbits, of course. But with such a confusing case they need much more clarification before they can even be seriously introduced. In fact, the case is one hard to fathom let alone proceed with. Many around the case are disposed to believe both in supernatural power motivating a dark element within the Church and a dark power acting on its own or in possession of some individual. Many are motivated to fear someone in the Church. It is this element that is disposed to believe that the claims of the local sheriffs is just a way to make people believe they are truly trying to do something rather than just sitting around afraid of the local diocese. The sheriffs believe or prefer to believe in the “common motive” but haven’t in 17 years found enough to underpin their suspicions. They are not qualified nor capable of investigating the Catholic Church diocese in question, and after corruption was uncovered in the diocese in 2002 it was clear there was truth to the allegations Father Kunz was going to bring. Thus it would seem only a capable Catholic priest like Father Brown is in a position to do what needs to be done here. Such was Father Kunz, but he has been murdered and no one has taken his place in 17 years. Perhaps I’m dating myself, but I prefer to liken investigating this topic to “doing the Hammer thing.” Yes, I’m speaking about the late great British film company Hammer Films. It gave us a genre of mystery, adventure, horror, dark deeds and twilight superstitions. I’ve been called the real life Kolchak— that’s a nice compliment— but I prefer the sophistication that Hammer sleuths projected, and the often erudite way they investigated subjects. 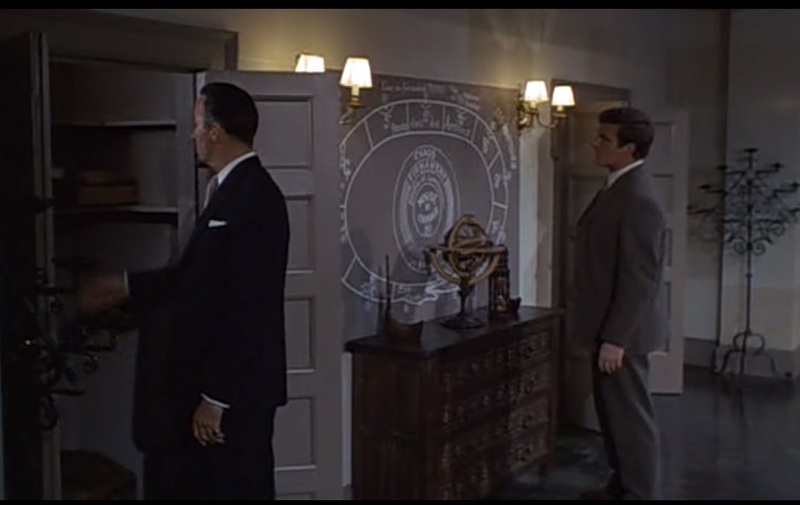 For the one genre that we associate with twilight, “Occult” is so much the better word. It merely means “hidden.” It’s the old word used for the entire subject of the unexplained before something as inaccurate as the designation “New Age” or “paranormal” became popular. Within this realm are Gothic cemeteries, midnight practices, ruined cloisters, and often the dreaded “B” word. No, not that. It’s a French word— Bourgeois. Not the American meaning. The French meaning. You also pronounce the “r” in French. All it literally means is a non royal citizen of a town. By extension it means city-dwelling culture, that dreaded element that lives with one goal . . . outdo the Joneses. Power! The Hammer film “Witches” revealed how an otherwise unremarkable woman could lead a nest of country bumpkins into a murder cult. Joan Fontaine defies them here. I’m a bit cynical about the Occult. Anybody who uses the “B” word is revealing cynicism. Let me tell you why. It has been my experience that many within the narrow city culture break free by engaging in midnight ceremonies and bizarre rituals. By doing so they feel they’re no longer the obscure bourgeoisie. They now feel important. They are conduits of greater powers, practitioners of hidden knowledge. Yet what is the substance of all this? Because they are robed in the night and ensconced in clandestine grottos, they are at the very least masters of what people fear the most— the unknown . . . the Hidden. Their knowledge is also arcane. People fear what they do not know. They fear the symbols of the Occult, for they come from the night and from behind drawn curtains. People fear the night. This is the Occult’s real power. It creates its own reality. People fear it more than they believe in it. Ancient symbols, pentagrams, the goat of Mendes. . . Is there really power in such things? Perhaps. There is power in anything you believe in. 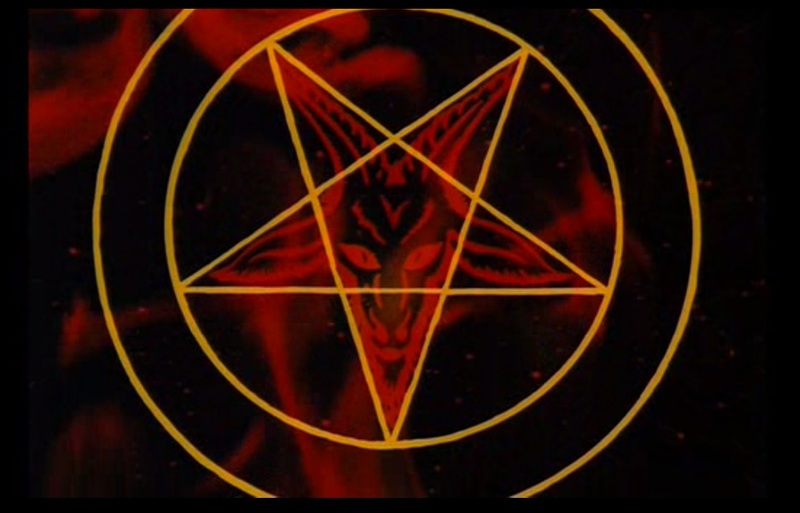 Does there have to be power behind such symbols and mysticism for it to be a danger? No, not really. It rests in what the practitioner believes. If you believe to be a witch means engaging in harmless nature religion and curing people with remedies from organic compounds in the forest, you will be harmless to a community. If you believe it means devil worship, voodoo, spells and infant sacrifice, you will be quite a problem for a constabulary. The case of Madam Voisin is classic. It ended with her head on the block in Louis XIV’s France. Occult as a word now is reserved more or less for those who practice arcane rituals from old mysticism. On its own, this is rather insulated and there isn’t much interest for any sleuth. But anything that can go bump in the night can be backworked. That “bump” is so important. It’s a solid reaction that must have had an action. Because of this, out of all that is so “outré,” there is one thing that can be investigated, and it is the most interesting. Yes, “Haunted Houses” if you must call them that. As I said, the supernatural can’t be investigated, but the effects of the unexplained can. Haunted houses can’t be “haunted” unless they’ve exhibited “symptoms.” Unusual sounds, poltergeist effects, moans and so forth mean a haunting. A haunted house is not an explanation or solution. It is a symptom. Therefore it can be investigated. The Uninvited by Dorothy Macardle gave us our first sophisticated ghost story. It, too, was partly inspired by Borley Rectory. Investigating claims of hauntings can be quite stimulating, and even very erudite in the right crowd. Such popular and influential films as The Haunting and Legend of Hell House were actually based on some of the real-life investigations carried out into the haunting of Borley Rectory in England, the Godfather of all haunted houses. . . . before Harry Price mucked it up. The plots they give us, to say the least, are very intriguing. Though I’ve often disparaged “paranormal” I have often thought that the most thrilling thing would be to spend a weekend in such a grand old mansion with a sophisticated set of investigators and give the old qui vivre to an investigation. Some very stimulating discussion, that’s the thing! We hear the legend for the first time. 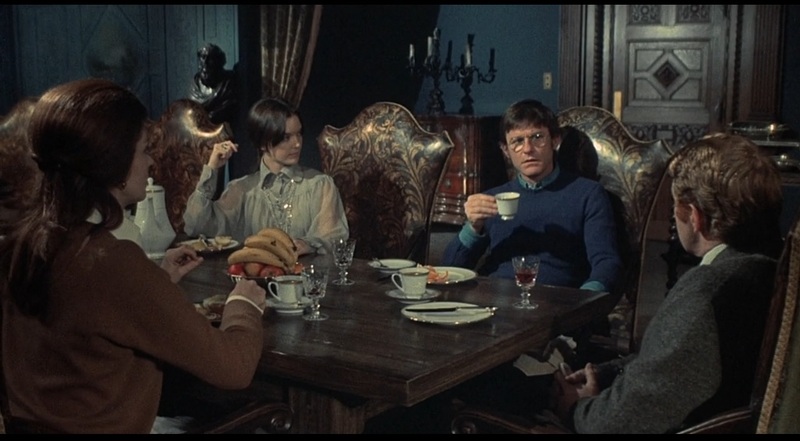 Table discussion on the past of the Balasco house — The Legend of Hell House (1973). 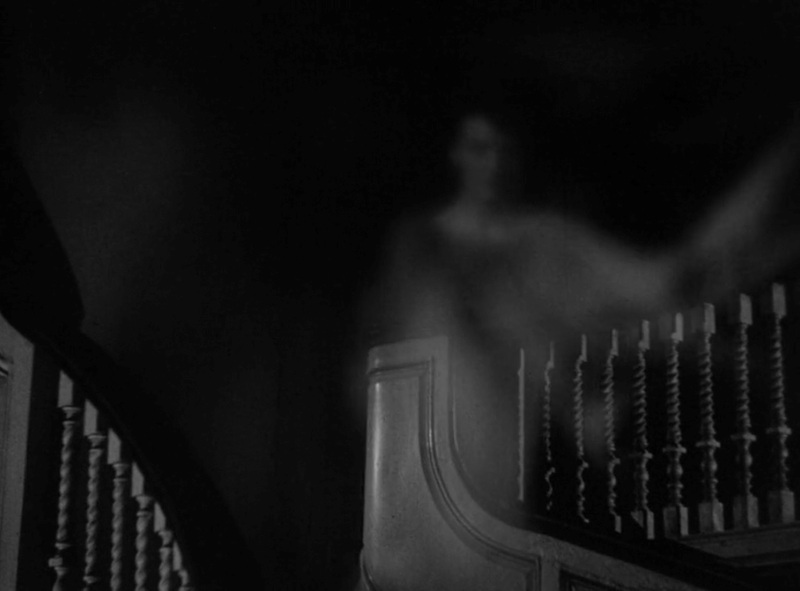 But, you may ask, what if the haunting truly is supernatural? Investigating, Hammer style. The Devil Rides Out. Classic 1960s Hammer. Logic is a necessity to understand all things. Logic is immutable. Anything that has intelligence has volition. It will act according to its motive. It doesn’t matter if it’s angels and demons and ghosts, or, to put it quite like in Legend of Hell House, “surviving personalities.” If they exist they will act according to their motive and thus the criterion of logic must apply. The symptoms in a haunted house can be backworked. Intelligence can be second-guessed. Significant Anniversary . . . Interesting Pilgrimage. It’s part of the genre. It’s part of the comic strip. That doesn’t make it bad. So long as we label it properly, there’s no harm. My only gripe is when legend obscures truth. 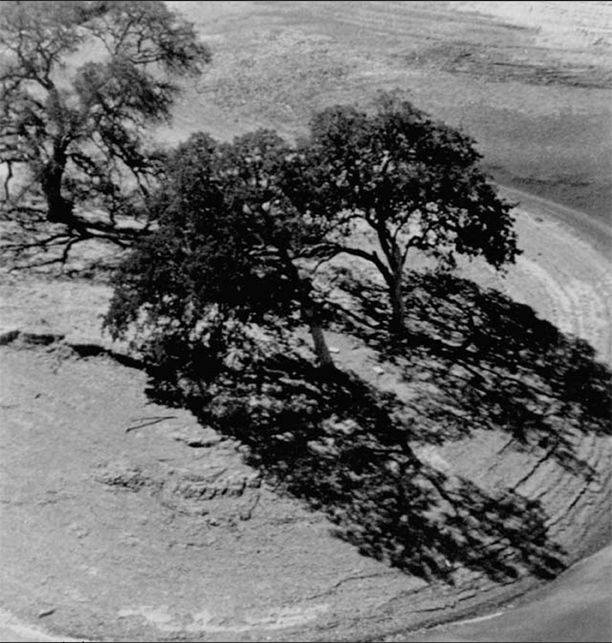 There’s a reason why The Zodiac Killer’s attack at Lake Berryessa on September 27, 1969, is quite significant. There’s a reason why pilgrims travel to the site today. Let’s backtrack a bit to put it in context. 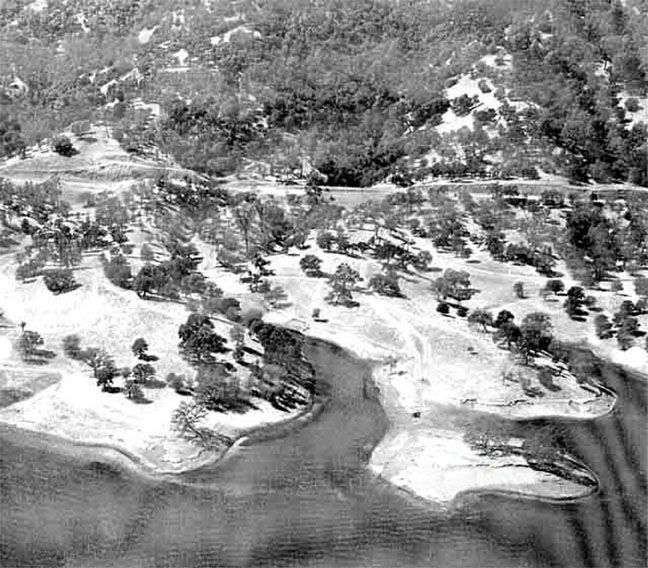 Contemporary photos of Zodiac Island seen from the air. It’s only an island in winter when the lake levels rise with the rain. It’s quite a walk to Knoxville Road in the background, and it becomes steep nearer the road. 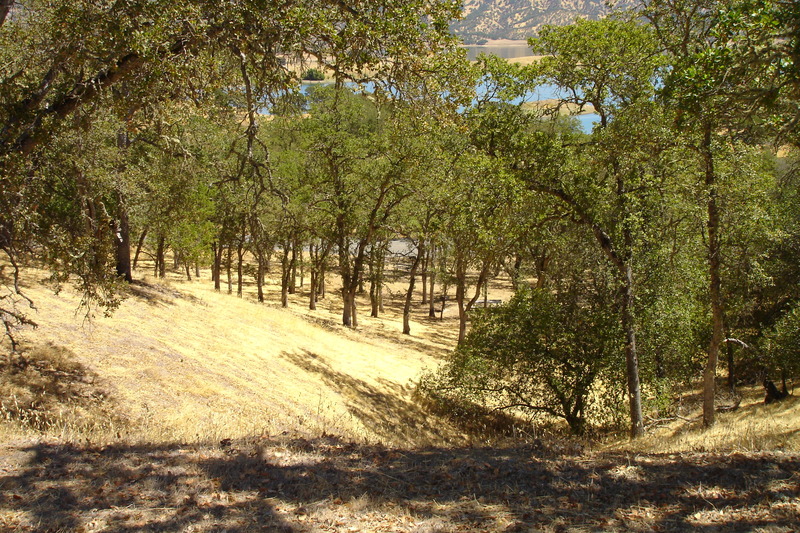 Up until his attack at Lake Berryessa, ZODIAC had essentially been a drive-by shooter. This didn’t require any elaborate preparations or any real ingenuity. At most it reflected his arrogance to add one more ante to his game of death. The killings were his résumé by which he was now terrorizing the Bay Area in letters to the newspapers. No other interpretation could be drawn until . . . Lake Berryessa. 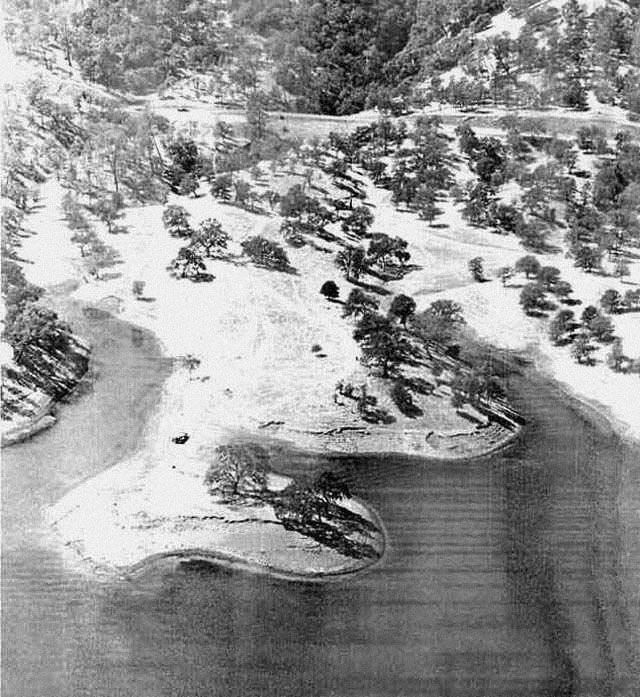 When ZODIAC attacked at Lake Berryessa, it was different. He endangered his escape by having parked 1/4 of a mile from the attack. 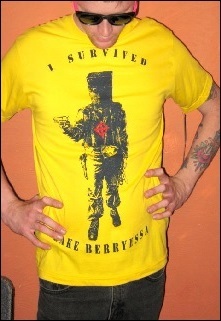 He also knifed the victims, which of course was a close quarter killing. Most strange of all, he wore a bizarre, theatrical black hood that had a bib on it that hung down his chest. On it was neatly sewn the symbol of the Zodiac– circle with a crosshair. Standing on Knoxville Road, Zodiac Island peaks through the trees at Lake Berryessa. It’s quite a walk. ZODIAC went out of his way here. Was the location important? None of this was required to ruthlessly dispatch these two youth. Why did ZODIAC go to so much trouble here? Sheriff composite based on Bryan Hartnell’s description of his attacker. ZODIAC’s last attack would be a cab killing, where he shot a cab driver in San Francisco. Again, no real ingenuity required. Nothing exotic. It was in execution little different than some thug killing. It was just another ante in his game of death. It was so different from his MO that he knew he had to mail in a piece of the victim’s bloody shirt to prove he was the killer. 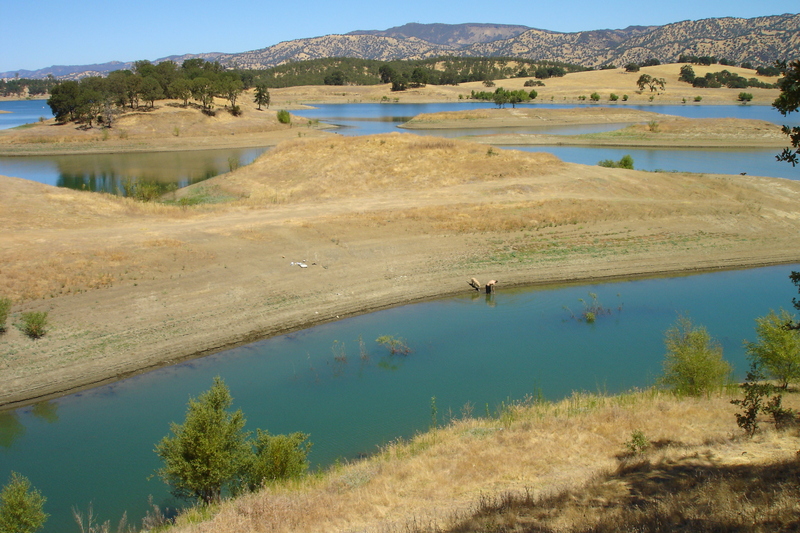 Why did he take such risks at Lake Berryessa? Daytime doesn’t explain it. This was ZODIAC’s only daytime attack. But this doesn’t explain the hood. The victims were not meant to survive. We were never supposed to know ZODIAC dressed like this. The man was stabbed 6 times, the woman 21. But the woman, Cecelia Shepard, survived for a day and a half; the man, Bryan Hartnell, survived to give us his account. Why did wearing that homemade, theatrical hood mean something to ZODIAC? Zodiac Island in 2012. The 3 huge oaks have fallen and the peninsula is bare. It wasn’t fear factor. ZODIAC didn’t jump out from behind the oak and declare ‘I’m the infamous ZODIAC. I’m going to kill you’ and then feed off their fear. Rather he said he was an escaped con who wanted their money and car keys. The hood really didn’t register with them. Bryan Hartnell kept chatting with the guy and even offered to write him a check for more money. ZODIAC finally got impatient. Someone wearing a ski mask points a gun at you there is no ambiguity as to what they want. Such a theatrical hood really implied nothing when added to ZODIAC’s bland excuse for holding them at gun point. Clearly it meant something. A ski mask wasn’t good enough. It had to be this executioner type of black hood with the Zodiac symbol on it. Famous illustration of ZODIAC at Lake Berryessa. He held them at gunpoint, then tied them up and knifed them. He gave no excuse to them first other than he has to kill them. Well, there is no point in trying to dissect it here. You can consult my page on it at The Quester Files for more details. Let’s rather come to the present, to September 27, 2015. 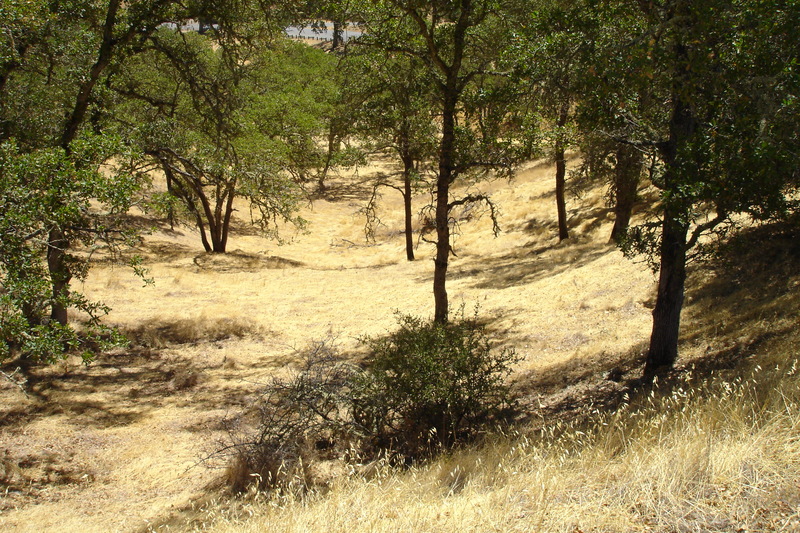 The above helps you to understand why today many of those who follow the case of The Zodiac Killer will make a special pilgrimage to Zodiac Island at Lake Berryessa, the scene of the attack. This attack represents something significant and because it is so exotic it has come to symbolize ZODIAC and to imply some arcane reason for the murders– thus it may be a clue. Pilgrims will gather at 6:30 p.m., the time of the attack. They will remember Cecelia Shepard with a moment of silence. Then they will follow the ZODIAC’s trail up the hill to where he parked on the road. Then they will pile in cars and follow his route into Napa, to where he called the police and confessed to the crime. Then they will go out to dinner and discuss the case. Let’s look at this in pictures. What remains of the oak. 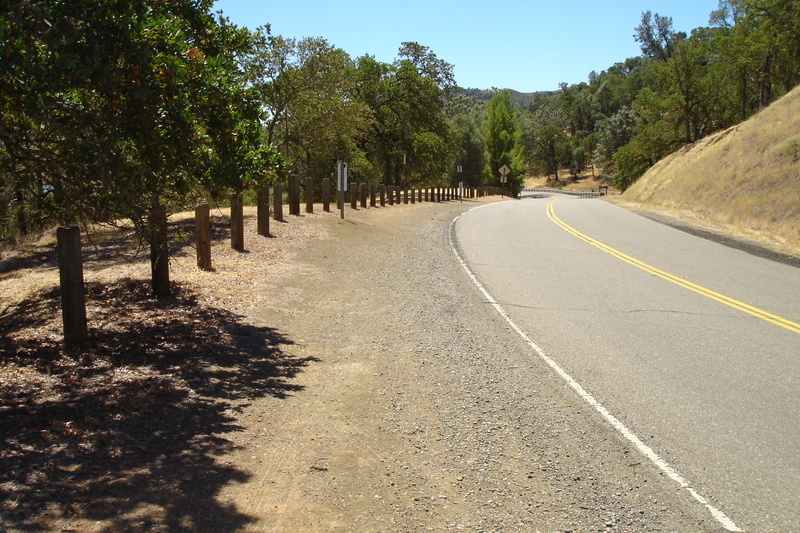 ZODIAC walked up here to the victims’ car on the road. ZODIAC upped the score on the victim’s car door. Knoxville Road today. . . Rogue For a Reason . . .
Aristotle left us a couple of good quotes. Well, more than a couple of course. But a couple that truly apply here to investigating the world of mysteries. The truly high minded man does not care what people believe; he cares about the truth. Put together this basically sums up why I don’t mind investigating any type of mystery that catches my attention. I don’t care if it’s ghouls and goblins, things that go bump to Scooby Doo vibes, grizzly murders, or lost treasure. I want to discover the truth. It’s thrilling both to pursue and crack a mystery. But I don’t join in. By this I mean I don’t become part of the genre. I love to share what I’ve discovered with my readers here and in my books. But I investigate the cases, each case on its own. I’m not a chronicler of the genre. Rene Dahinden, of Bigfoot fame, became the greatest example of violating this approach. Toward the end of his life even his supporters had to admit that he had been “a man who investigated men who investigated Bigfoot” rather than a Bigfoot investigator. He had become nothing more than a character in the genre, a player in a real life comic strip. Yet his image was that of one of the most significant hunters and investigators of Bigfoot. Far from truth. He investigated claims. He became reactive rather than proactive. Few in any popular genre rise above this mistake. They become chroniclers, but of what? One element becomes folklorists and another their debunkers. But who actually investigates the topic– whether it be UFOs, Bigfoot, occult claims, or classic Cold Cases? An actual sighting? An actual case? Others memorialize an incidence. Like a history student may visit the battle site of Waterloo they visit a location made famous in one of the genres– Zodiac Island or Ape Canyon. Or they search for holy relics like Empress Helena. Bigfooters go to the spot where Roger Patterson filmed a “Bigfoot” and they try to reconstruct how it was done to prove the film is of an authentic Bigfoot. Hasn’t anything more interesting happened since 1967? This is all fine, but label it for what it is. They’re chronicling, relic hunting, or tourists of a real life action cartoon. How about another example, one that piques the interest of true crime buffs? The “Smiley Face Killer Theory.” It’s elaborate, often farfetched sounding, and even its proponents admit a smiley face exists in only 17% of the cases. But it’s a catchy title. 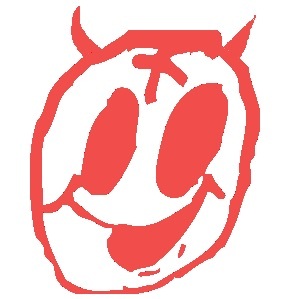 Some commentators have been glad to dismiss it by saying that the smiley face is only a coincidence. Does that really matter except to the title and to one facet of theorizing? Many of the cases are still suspicious and in one case the verdict of accidental death was overturned in favor of homicide. Removing the catchy title doesn’t change the substance of each case and how similar they are as a whole. Perhaps there is no smiley face killer gang, but are these cases of “accidental drowning” reflective of the pattern of a serial killer? It is better to seek the truth rather than to merely become a burp in the vast whirlwind of popular discourse on a topic. Perfect example of real life comic strip. Who wants to be a part of that world? The mainstream, which made these topics so hot at one point, has squarely said “No.” They don’t want to be a part of it. They walked away when these topics became rehearsed formula and cottage industries. But the mainstream still want the truth. . . if someone is willing to dig into it in a sober manner. Cash cows won’t die. But they may give a different milk. Truly, what is the truth behind these topics? In many cases I have found it very fascinating. As we approach that witching time of year, it is best I put this post up so that readers will prepare for a glimpse behind the popular curtain of some very strange and at times frightening subjects. For some it will be an interesting glimpse, for others perhaps a disturbing one. But there is something out there in the dark, in the forests, and beyond our gaze of the sea at the beach. It takes a long time to learn one’s way around. No school can teach you the ins and outs. For cold cases, it takes lots of on-scene investigation and risking danger in shady parts of town. It takes lots of contacts, lots of time building up your reputation. But you will find investigating these X Files subjects is a fascinating and rewarding journey, far more productive than merely wedging oneself into popular discourse on them.